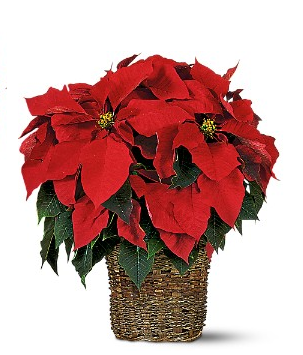 Poinsettias are the flower that's probably most associated with Christmas. Their beautiful red colour matches the spirit of the season perfectly, and they are a hardy, durable plant that requires relatively little work to keep looking fresh. Though there are many types of flowers appropriate for December, as the big day approaches, interest in Poinsettias in particular spikes sharply. They make a great gift, or just as a purchase to bring a little Christmas joy into your home in time for the holiday season. Bloomex has a selection of baskets and arrangements specially available, and our product of the week is the Elegant Poinsettia Basket. At under $30, it's an amazing way to add some cheer and festiveness. And if you're looking to make an even bigger splash, check out some of the larger baskets we have at great prices for the 2013 holiday season.